Welcome colleagues! I’m happy to have the opportunity to share with you my vision of The Co-Walkers, Awakening as a tool for learning, especially within an integrated interdisciplinary unit (which I believe to be the most natural and effective way of learning). But whether a novel study (teacher resource pdf)provided) or part of a larger program, The Co-Walkers, Awakening has been written with the hope that parents and teachers together with the young people in their lives will be inspired to explore ways in which we can create a better world. Although I hope individuals of all ages will be able to enjoy The Co-Walkers, it was especially written for young people in the middle grade years (8-12 years old). The reason I chose to speak to this group is because as teachers and parents we know that this is a very special stage of development. Although there is tremendous diversity in knowledge and skill level, there are some common themes associated with this age group. These young people are developing a stronger desire to become more independent from their parents and family, and they are developing a stronger sense of right and wrong which is being integrated into their definition of who they are and what they would like to do with their lives. 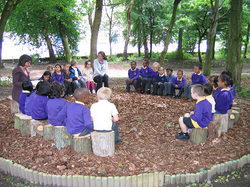 This means they are also beginning to think more about the future and developing a sense of their place in the world. While all this is going on they are also becoming much more influenced by their peers and wanting to fit in or be accepted by their friends. This growing desire to be liked and accepted at the same time they are trying to become more independent from their family leaves them vulnerable to both positive and negative influences. To complicate things further, it is typically in this stage that puberty is experienced. They now must also learn to cope with their emerging sexuality and all the expectations, confusion, and physical changes that come along with it. Many of these children are also becoming more aware of their personal circumstances and that may have a profound emotional impact on how they see themselves. Poverty, divorce, death, discrimination, etc. can all begin to define them as they become more aware of the significance of these circumstances in their lives and how others view them. Because young people in this age group are typically increasing their mental skills dramatically, they can learn to describe their experiences and thoughts in a much more in-depth manner than ever before. Whether through music, poetry, writing, dance, painting, building a website, or role playing – creative expression can be a powerful tool to help students connect the dots for all the information they are gathering, understanding its relevance to their lives, and using the information to make important choices about who they are, who they would like to be, and how they can achieve their goals. Their desire for self-expression and growing interest and concern for others can be nurtured and supported in such a way that can combine to build the resilience and love for learning that will serve as the foundation of success for the rest of their lives. Choice – who am I, what will I become, who do I want in my life, what is my truth, etc. Tenacity- strength and courage – where does inner strength come from, what does it mean to have the courage of conviction, how do I stick to my path (justice) of what I consider right and wrong, etc. Faith – in one’s self, in the ones we love and trust, in our community – truth is love (a belief or attachment to someone or something that enriches you). Ashley, Brian and Matthew are on a quest to save themselves and their worlds from destruction. The real enemies are fear, hate, and limiting beliefs. The adults in their world have in one way or another abandoned them - until they discover Elvira and her garden. She provides a new way of relating to the universe, seeing themselves, and providing them with the skills and knowledge that will empower them to transform themselves. Through, concrete, hands-on learning activities, middle childhood is a time when children can gain enthusiasm for learning and work – because it is seen as a creative expression of who they are. Imagination unleashed is more powerful than any video game, computer processor, social network (although all of these things have been the result of imagination) or any other passive form of learning – yes, passive. Even the most abstract and complex ideas can be broken down and tackled. When achievement and self-expression go hand in hand, competence and self-esteem grow. Learning is a risky business for many children because they have already learned that being ‘wrong’, making mistakes, or incompletion of tasks can lead to humiliation. But when perseverance, taking on difficult tasks, willingness to learn challenging new skills to achieve goals are all defined as positive (and failed attempts considered a normal part of the learning process), the spiral of learning and motivation take off and reach heights never imagined by either the student or the teacher. Middle childhood can be a happy time marked my increased independence, new interests such as sports, art, music, and even politics and community activism. But it is also a time (especially in the third and fourth grade) when many educators and parents notice a shift. As the skills required for academic skills become more complex, some fall farther behind. Most often it has less to do with ability and more to do with work ethic, self-esteem, emotionalism and/or lack of resiliency to cope with home and personal challenges. Decreased motivation to succeed is largely due to negative associations made with learning. These patterns of thinking and behaviour can become permanent and negatively impact a child’s future ability to succeed in school and in the work place. We have seen the increased prevalence of school violence (including all levels of bullying), eating disorders, drug use, anxiety and depression, sexualizing for attention, and a variety of anti-social behaviours usually associated with older youth and adults, affect this age group. There is more pressure on schools and teachers to recognize problems in eight to twelve -year olds, and teach children the social and life skills that will help them become healthy teenagers and adults. But these skills cannot be taught without the framework, philosophy, or values that support and encourage children to embrace this information. The Co-Walkers offers a framework or philosophy that teaches justice, connection to community and nature, and the power of choice. Magic is transformation, spirit is about personal strength and integrity, and knowledge is about connection to the past and imagining a future. Without these 3 – the three kindred (faery (spirit), humans (knowledge and community), and nature (a healthy environment) – equally important and in balance, the great awakening of our power as individuals cannot happen. The ultimate goal is happiness. It is what we wish for our children and what they should wish for themselves and others. It is a happiness built on achievement, pride, generosity of spirit, and a deep felt connection to humanity and the environment that nourishes us as human beings. Rapture of existence – the love of life -mere existence is important. The Co-Walkers, Awakening (the first of a trilogy) was written to be especially used with an interdisciplinary approach to teaching. Mythology, environment and ecology, ancient history, language arts , and art (music, dance, visual arts) are all subjects that can be successfully integrated into the the web of learning using the novel as a jumping off point. Character or values education, civics or community activism, and health education are also natural offshoots. Below is a sample lesson unit which includes a learning flow chart, suggested activies and chapter questions. Fundamentally, the goal of this integrated unit is for students to learn how our beliefs impact our reality. Our beliefs, values, and perceptions impact the choices we make in every aspect of our lives -the environment, the economy, how we see our past and the future, as well as how we relate to our friends and family. Changing our beliefs, therefore, can change our reality. Magic is about transformation, spirit is about inner strength, and truth is about choosing to live a happy life. The Co-Walkers, Awakening is available now at Chapters Indigo, Barnes & Noble, Amazon.com, ParentsBooks and other international booksellers in Hardcover, Softcover, and ebook. The Co-Walkers Study Guide coming soon!